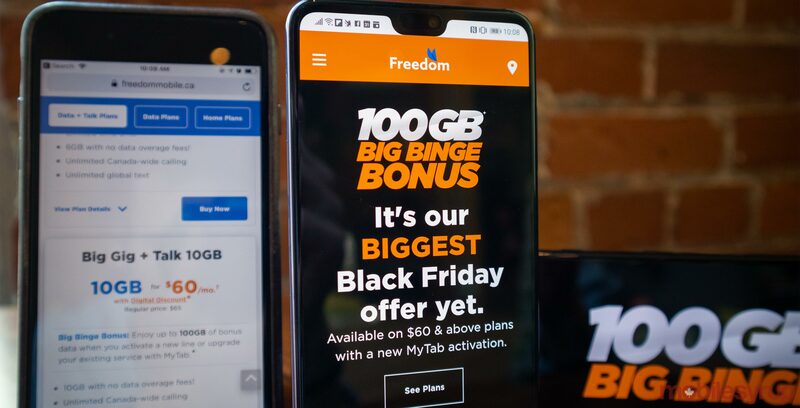 Toronto-based regional carrier Freedom Mobile has expanded its Big Binge Bonus promotions for a limited time. Each plan comes with unlimited Canada-wide calling and unlimited global texting. Previously, Freedom offered 30GB of Big Binge Bonus data with the 6GB for $55 per month plan. These plans offer unlimited global text and Canada-wide calling at $0.05 per minute. Previously, the telecom offered 30GB of Big Binge Bonus data with the 10GB for $55 per month plan. This includes unlimited talk and text in the home network only. Previously Freedom offered only 15GB of Big Binge Bonus data with this plan. You can also save $5 with each plan with the ‘Digital Discount.’ The Digital Discount occurs when a subscriber sets up pre-authorise payments. Big Binge Bonuses are an allotment of data that doesn’t expire as long as the subscriber continues to use an eligible rate plan. The bonus data doesn’t reload on a monthly or annual basis. Once subscribers have consumed all bonus data, it entirely runs out. Users begin to consume the bonus data once their monthly allotment runs out. Freedom first introduced the Big Binge Bonus on November 19th.